Charles Junior Miller was born September 26, 1918, in Crown Point, Indiana, the son of Charles and Marie Collins Miller. On November 6, 1918 he was baptized in the name of the triune God. He reaffirmed his loyalty to the Captain of his salvation on his confirmation day, May 17, 1931. Both the Sacrament of Holy Baptism and the Rite of Confirmation were administered by Pastor Emeritus August Biester. Charles entered the service of his country March 17, 1943. 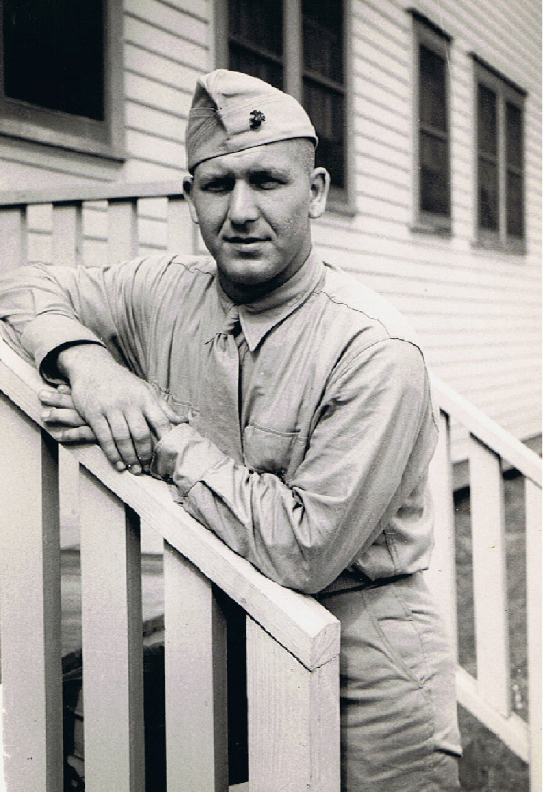 Having received his basic and more advanced training at Parris Island, South Carolina, Quantico, Virginia and Rochester, New York, he left for foreign service in October 1943. He saw combat on Guam, Guadalcanal and Okinawa. According to the citation accompanying the posthumous presentation of the Bronze Star Medal, Charles was mortally wounded on May 11, 1945 while photographing the coordinated action of our tanks and infantry during the battle for Okinawa. Charles passed away at the age of 26 years, 7 months and 15 days. Aside from the bereaved widow, the former Marian Anderson, and little daughter, Carole, who now reside in Alhambra, California, he leaves to mourn his passing four sisters, Anna Mae and Gladys of Crown Point, Mrs. Ruth Wilson of Gary and Virginia of Wisconsin. We deeply mourn his passing, but humbly bow our heads before our Lord, who doeth all things well. Pride and sorrow…an unusual combination of emotions for one to experience simultaneously, but that is what I feel. Much like happiness and sadness, it seems as if these emotions are somewhat in opposition with one another, and should therefore be felt separately, but not so for me. Mourning the loss of a loved one who gave so selflessly for God and country is a bitter pill to swallow, to be sure, but the sense of pride that comes from knowing that this life was not left on the battlefield in vain can serve to sweeten the bitterness…if we allow it to. My journey through history…my grandfather’s history…made me proud of who I am, and of where I came from. A lot of questions were answered while going through the dusty letters and photographs in those boxes that Mom brought over, and an image of a strong, courageous and devoted man has now been indelibly etched into our minds. We are humbled by the thoughts of tens of thousands of men like my grandfather, men in the prime of their lives, laying down their personal aspirations for a time to serve their country and to fight to oppress tyranny and hatred a world away. Their stories inspire thoughts of simpler times, indeed, but it would be foolish to assume that the emotions that these men felt as they stepped into harm’s way were any different than they are now. Charles J. Miller was one of those men, a patriotic, God-fearing, hard-working American who became inspired, no… incensed by the attack on U.S. soil at Pearl Harbor, Hawaii by the Japanese in December of 1941. Charles found his opportunity to serve his country’s armed forces when he read an article in a photography magazine profiling the Marine Corps’ photographic unit. Charles already had a love for photography, and this sounded like a great fit for him. He soon filed his enlistment papers and, with a young wife and a one and a half year old daughter at home, he held his head high, put self aside and joined the United States Marine Corp on March 9, 1943. Charles went through Basic Training at Parris Island, SC, then on to Quantico, VA and Rochester, NY for advanced training. Assigned to the United States Marine Corps III Amphibious Corps, Photographic Section, Charles was deployed into foreign service on November 18, 1943. His assignments put him on the front lines on Guam, Guadalcanal and, finally, Okinawa, Japan. Always the devoted husband and father, Charles wrote literally hundreds of letters home during his deployment, all of which were cherished by their recipient, my grandmother, and which remain in the possession of Charles’ surviving family. These letters chronicle the life of a man living a world away from home and from the warm and comforting embrace of his loving wife and child. Undoubtedly, he longed to hear their voices, but the regular exchange of letters would have to suffice. It is heartwarming to read the words shared between two people who were so deeply in love and trying desperately to make the best of a difficult situation. So closely connected, yet separated by so many miles. During WWII, Marine Corps photographers worked diligently to record the action of battle for intelligence and public relations purposes. This often placed them in harm’s way, and right in the midst of grave danger. Armed only with their cameras, these brave men regularly found it necessary to press forward further and further toward the fighting in order to capture the detailed information desired by our military leaders. Often, these photographs were instrumental in identifying enemy encampments, movements, tactics and strongholds and then helping to shape our military’s response. On May 11, 1945, as troops from the 22nd Marine Regiment pressed forward toward Naha, the capitol city of Okinawa, in a concerted effort to capture and hold this key location, Corporal Charles J. Miller was moving forward with his camera to a small ditch to gain a better vantage point when he took a direct hit from an enemy mortar shell. He is reported to have died instantly. His death came a mere 3 months prior to VJ Day, August 14, 1945, the day that victory over Japan and the end of World War II were declared and celebrated. In all, 14,091 allied forces lost their lives in the Battle of Okinawa, but the loss of this one life in particular has changed the course of history for our family. We are so very proud of the man that Charles was, and I pray that we may all strive to funnel that sense of identity and pride into positive and honoring avenues that perpetuate the spirit in which so many gave of themselves in defense of this great country.